This week's song is Bibbidi-Bobbidi-Boo performed by Verna Felton as the Fairy Godmother in the 1950 animated version of Cinderella. The novelty song, Bibbidi-Bobbodi-Boo was the most popular tune from Walt Disney’s 1950 animated film Cinderella, becoming a chart-topping hit for artists like Perry Como and Dinah Shore. 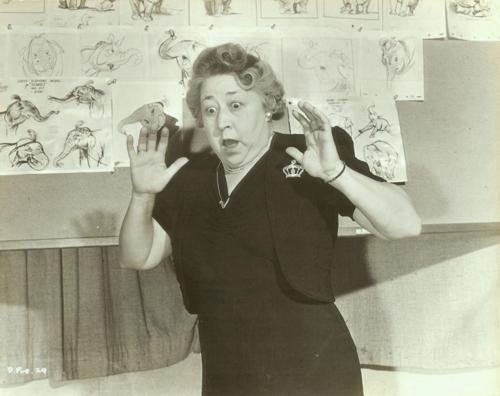 Verna Felton acting out the Fairy Godmother role for Disney animators. Cinderella is so closely associated with the Disney brand that the studio is releasing a new live-action version today (March 13) that they hope will capture the public’s imagination just like the original Cinderella did in 1950. The animated version is still one of Disney’s most popular films; in fact, Cinderella saved the Disney studios from serious financial trouble in the early fifties. Walt Disney and Cinderella share a magazine cover. Walt Disney is one of the great American success stories. The son of itinerant, working class parents created a multi-million dollar empire out of talent and hard work. Disney achieved great success in the thirties with Mickey Mouse and Snow White and the Seven Dwarfs (1937), but the studio took a large hit during World War II because of the loss of the European market. Disney turned to live-action-animation combinations like Song of the South (1946) or package films like The Adventures of Ichabod and Mr. Toad (1949) to make it through the difficult postwar period. 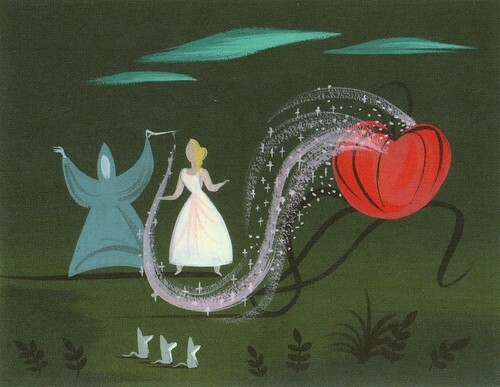 A beautiful piece of concept art by Mary Blair for Fairy Godmother sequence in Cinderella (1950). Disney returned to feature animation with the popular fairy tale, Cinderella (there are many versions of the classic story, but the Disney film is most closely based on Charles Perrault's version). For the first time, Uncle Walt hired outside songwriters and the team of Mack David, Al Hoffman and Jerry Livingston wrote several songs for Cinderella including A Dream Is a Wish Your Heart Makes and, of course, Bibbidi-Bobbidi-Boo. The bouncy tune with nonsense lyrics like "Salagadoola mechicka boola bibbidi-bobbidi-boo" works perfectly with Felton's portrayal of the endearing, but scatterbrained Fairy Godmother. Bibbidi-Bobbidi-Boo was actually a hit song before Cinderella was released. Ilene Woods and The Woodsmen -- Woods was the voice of Cinderella in the film -- recorded the first version (clip above). Perry Como and The Fontane Sisters had a big hit with a jazzed-up version of the song in autumn 1949 (clip below). Both Woods and Como's versions include an extra stanza that is not in the film: "If your mind is in a dither/and your heart is in a haze/I'll haze your dither/and dither your haze/with a magic phrase." Bibbidi-Bobbidi-Boo is still part of pop culture. Anyone who's been on a Disney cruise is familiar with the Bibbidi Bobbidi Boutique and versions of the song have appeared in everything from video games to SpongeBob SquarePants. Verna Felton's original version gained new life in 2014 when the song was featured in a Gatorade commercial for the World Cup, featuring international soccer stars like Sergio Ramos and Landon Donovan (clip below).